iPhone X Drop Test Proves It's the Most Breakable iPhone Yet? Samuel L. Jackson's Mr. Glass and the new iPhone X have a lot in common. They're both extremely fragile. As Apple's latest release proves to be the most breakable iPhone yet. It is made out of glass, after all. And as we all now, glass breaks. This discover certainly didn't take very long. 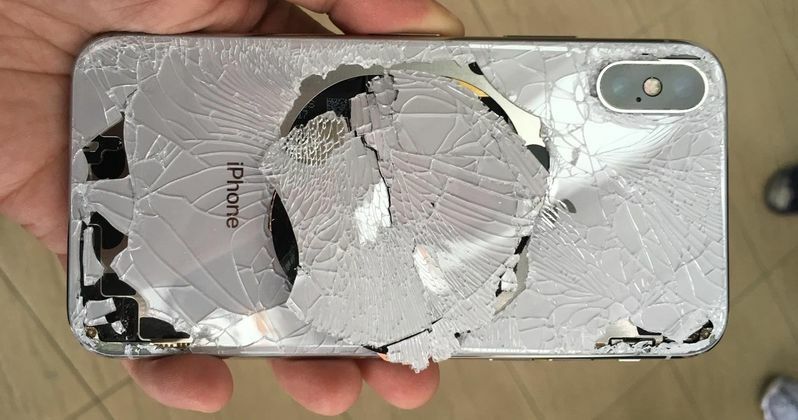 A man in China has already dropped and destroyed his brand new iPhone X. Apple has been advertising that the new iPhone was made with the most powerful glass yet, but that appears to be quite the exaggeration since the brand new, expensive as hell phone is now destroyed and worthless. Demand for the new Apple product is off the charts since this is the first real evolutionary change in the iPhone in 3 years as the body and shape of the phone has been the same since the iPhone 6. The video evidence of the utterly destroyed iPhone X comes to us from China and is advertised as an iPhone X "drop test," but it's the only video from the channel labeled as such, leading many to believe that it's a tongue-in-cheek joke due to the man accidentally dropping it. The results are catastrophic, but should make anybody who recently purchased the crazy expensive phone feel some comfort in knowing that somebody else did it first and it just so happened to be on the day that the coveted phone was released. CNET decided to actually take the phone through the ringer and give it a proper "break test" and while the results aren't as disastrous as the poor dude from China's, the phone did however break on the very first drop, shattering the glass on the backside of the phone. Next up they did a scratch test where the iPhone X fared slightly better. The good news is that house and car keys did not provide any scratches to the front or the back, but some sandpaper was able to leave some decent marks. So, don't rub your new $1,000-plus fun with sandpaper and you should be ok.
Basically, what these stories are trying to tell people that have purchased the new iPhone X is to buy a case and buy it quickly. Otherwise, you're going to be in for a giant headache. The repair costs for the phone are astronomical, even with insurance, you're looking at least $300 to repair broken glass and that's hoping that nothing happened to the phone internally. Apple has yet to make a statement regarding their claims that the "strongest glass ever produced on a smartphone" breaks after falling from pocket-height. The glass backs on Apple's new 2017 iPhones might be really strong. They might even have a copper-infused layer like Apple said on stage earlier this month. But the claim that these new phones contain the strongest glass ever to be used on a smartphone is flat-out ridiculous and people are starting to call Apple out. It seems that there's always an issue with a new update or new Apple hardware. From antenna-gate all the way to today's iPhone X glass shattering with little effort, it seems that it's always something. While we wait for an explanation from Apple, check out the video footage of the shattered iPhone X from launch day below, courtesy of the Fun 360 YouTube channel.